We’re pleased to announce the launch of our latest project: Podlater. 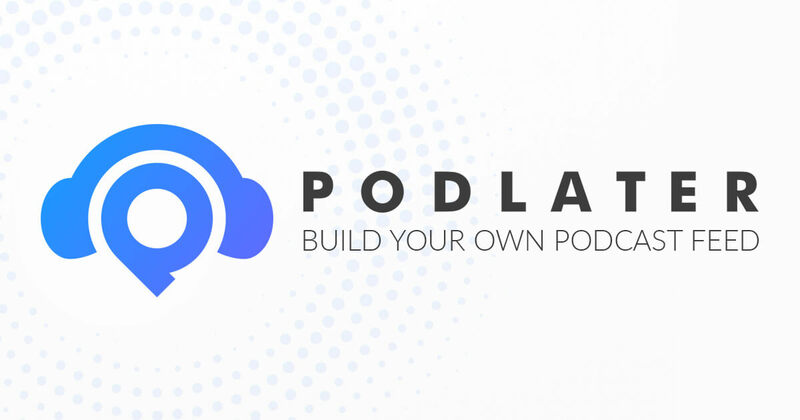 Inspired by popular applications like Pocket and Instapaper, Podlater lets you build your own personal feed of podcast episodes you find around the web. This is perfect for listeners who want to hear only one episode and not subscribe to an entire podcast. Create a Podlater account for free. Install the Podlater bookmarklet in your browser and add podcast episodes to your feed as you browse the web. Subscribe to your personal Podlater feed in your favorite podcast listening app. Podlater lets you improve the process of adding content to the podcast application on your phone. You can add individual episodes you find browsing the web to your app with one click. You’ll no longer have to subscribe, and then unsubscribe, to an an entire podcast feed just to hear one episode of a given show you are interested in. Podlater can help you provide valuable content for your customers or website visitors as well. You can create an account that collects and curates interesting podcast episodes for your given area of expertise or niche. For example, if you run a personal finance blog you could offer your visitors a link to your Podlater feed that collects the best finance podcast episodes on the web each week. Podlater is absolutely free. You can sign up for an account and be adding podcasts to your feed and app in under a minute. If you’re looking for an Instapaper for podcasts solution this site is for you.